I have known Dave Stein for many years. He’s an expert in the sales field, particularly in evaluating sales training. He has always been a clear and incisive thinker, with opinions as well-grounded in data as they are in thoughtfulness. His new book, with Steve Andersen, is called Beyond the Sales Process: 12 Proven Strategies for a Customer-Driven World. Dave and Steve shared some thoughts with me about the book, and about the state of selling. Charlie: B2B selling and buying have been transformed during the past 8 years—what changes have you seen regarding the role of trust in selling? And as salespeople seek to adapt to those changes, how are they doing? Steve and Dave: Beginning in 2008, when the last financial crisis hit, the concept of increasing revenues as a business objective was forced onto the back burner in many companies and replaced, or at least supplemented, with a scramble to reduce costs. In the process, the procurement function in many organizations gained unprecedented power, became more strategic, and began reaching further into daily operations. Mostly unprepared for this fundamental transformation in their customers’ business practices, many salespeople found themselves in over their heads, often floundering in their negotiations with “the new procurement.” Under pressure to produce, they responded by upping the ante, throwing more products and services at their customers, despite supply being greater than demand in most cases, and – most importantly – despite the fact that many of their customers simply weren’t interested in these additional offerings. The result has been a dismaying drop in the degree of trust that many contemporary buyers are able to place in their suppliers. Charlie: Shocking – who could’ve seen that coming! Steve and Dave: Right! Anyway, throughout this challenging period we observed consistently that sales professionals and account managers who truly understood their customer’s world—their wants and needs, the potential impact of external drivers on their business objectives, and the internal challenges they faced in meeting those objectives—continued to collaborate with and create value for their customers. For those top performers, earning credibility and focusing on the customer is an approach that continued to pay off. Charlie: Makes total sense. So, what precipitated the two of you collaborating on a book? Steve and Dave: After meeting and working together years ago at a software company we became friends and kept in touch as our careers continued on what might be considered parallel but related trajectories. Steve eventually leveraged his experience and expertise in B2B sales to establish Performance Methods Inc. (PMI), an industry-leading sales best practices consulting organization, and Dave authored his first book, “How Winners Sell” and went on to found ES Research Group, Inc. (ESR), an independent advisory firm that focused on B2B sales training. When Dave closed ESR several years back, Steve seized the moment and proposed that we join forces and share what we have learned and experienced with other B2B sales professionals. A co-authorship was born and it was based on a common perspective—that sales needs to evolve in order to keep up with the changes that buyers have adopted. We also share a real concern that the sales training industry all-too-often leaves the “guest of honor” off the guest lists at the sales training parties: the customer! Charlie: Indeed – seller-centric sales training is not the right idea. In the face of that drift away from the customer, what impact do you hope this book will have on the reader? Steve and Dave: In the past eight years, and frankly even in the period leading up to the recession, the idea of a strong, enduring customer relationship has withered and commoditization has reigned. In the fierce competition for customers, value, trust, and credibility have been pushed onto the sales “back seat,” while features, benefits, pricing, and a willingness to discount in order to win business sit up front. Overall, our observation is that this hasn’t been a period of growth for the B2B sales profession, and for that matter, for business in general. We wrote Beyond the Sales Process because we firmly believe that it’s time to rethink what has become accepted as the new norm—that in business, relationships and trust don’t matter so much any more. We disagree: not only do they matter, but we provide evidence in the book that relationships matter now more than ever. Charlie: As you might imagine, I couldn’t agree more. Steve and Dave: As salespeople ourselves, we also know that it’s not enough to simply urge our B2B colleagues (who face these challenges on a daily basis) to change their approach; they must be equipped with how to make those changes. They need to know why it’s crucial to rethink their approach, and they need to know how to implement strategies that will lead to more wins and greater success for themselves, as well as for their customers. Beyond the Sales Process provides what we refer to in the book as “actionable awareness”—proven strategies and tactics for developing, offering, and creating unique differentiable value that will directly address the customer’s external drivers, business objectives, and internal challenges, as well as their individual wants and needs. And we substantiate this by providing examples of industry-leading companies, their customers, and the actual people that are creating and co-creating this value together. Charlie: Companies don’t focus enough on developing new business from existing clients. What do you recommend for salespeople, account managers, and sales leaders seeking to build their trustworthiness and grow their relationships with their customers? Steve and Dave: Most sales book focus primarily on that small period of time when there’s a specific sales opportunity on the table, and that’s absolutely an important topic. But there’s another area that is too-often neglected—“after the sale,” you have an existing customer that has experienced your value. Will they want to work with you again? Did they realize the value that you and your organization promised to deliver? As the salesperson, are you going to stick around to measure and validate the impact you delivered? Are you willing to apply the lessons learned and adapt your approach? Your past proven value can and should be leveraged to build and strengthen your future relationship with your customer and provide you with momentum for the future potential value that you will create and co-create together. The strategies we lay out in the third section of Beyond the Sales Process provide a clear roadmap for how to make this happen. Charlie: In your book, you frequently use the word “trust.” Since you know trust is near and dear to my heart, how do you respond to those who believe that relationships in sales don’t matter much anymore? How can you make time for trust in our high-pressure, fast-paced B2B world? Steve and Dave: We’ve interviewed hundreds of customers over dozens of years, and not a single one has ever told either of us that relationships don’t matter. Credibility is a critical success factor for the contemporary salesperson—so as far as we’re concerned, the real question to ask yourself is this: how can I expect to be successful if I don’t make time to build trust? This is not just a theory or a philosophical argument. Over and over again, the numbers show that it is considerably more costly to pursue and acquire a new customer than it is to grow your relationship with an existing one. And, when a customer trusts that you have their best interests at heart, there’s a good chance that they’ll want to talk to you, to consult with you, and to hear what you have to say before they start developing requirements for their next specific opportunity. If you haven’t developed a relationship with your customer based on trust, you can expect to hear about their next opportunity at the same time that your competitors do, or worse, you’ll realize that your competitor may have been able to influence your customer’s thinking and view of success while you were waiting for the RFP to arrive. Before there’s a sales opportunity, the savvy salesperson realizes that they have an opportunity to build trust and credibility by understanding the customer’s world, how they define success, and by visioning value creation together. On the other hand, once the customer is in buying mode, they’re under a great deal of pressure, they’re stressed, and the opportunity to engage differently, explore possibilities, and vision success is lost. If you haven’t already taken the time to establish customer mindshare, you are just one of many providers clamoring for your customer’s attention, and you’ve missed a golden opportunity to build trust. Charlie: You obviously put considerable work into creating, vetting, and getting approval for your case studies. How were you able to get companies such as these to contribute with such depth? What was it was like working with these industry leaders to capture their successes and best practices? Steve and Dave: We’ve built trust with these companies over the years, and it’s reflected not only by their full participation in the case studies but also in their willingness to have their own customers to take part. 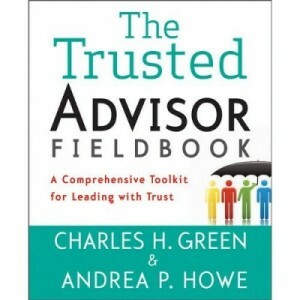 They demonstrate that the twelve proven strategies actually work by using them to create trust-based relationships with their customers themselves. They have embraced the idea that it’s not about control or manipulation, or a methodology that every reader or company has to follow in lockstep, but instead an approach that puts the customer first and creates value for everyone involved. It was an absolute pleasure to work closely with these smart and successful industry leaders, their people, and their customers to give our readers insights and actionable awareness that they can use to ensure their success with their own customers. Charlie: The market is responding favorably to the concepts in your book, including the notion of engage, win, and grow with your customers. How is this idea more inclusive, holistic, and customer-oriented than traditional sales approaches that have been around for a while? Steve and Dave: Focusing on benefits rather than features has long been accepted as the “right” way to peddle one’s offerings, but we think it’s an approach doesn’t go nearly far enough. How can you sell on benefits to the customer if you don’t know what they value? How do you establish credibility when it’s obvious you haven’t taken the time to understand the world in which they live? How can you build on the value you’ve created after the sale closes to grow trust and credibility, and to expand your relationship with the customer? In Beyond the Sales Process, we look at all of this, and we equip the reader to implement a new, more contemporary approach for engaging, winning, and growing your customer relationships, and for selling in the customer-driven world in which we live today. Charlie: That’s a great statement of the value of relationships in selling, and its linkage to some of the more traditional aspects of selling. Thanks guys for taking the time with us today, and best of luck with this excellent new book.